1.Preheat an oven to 350°F. Prepare the cake pans by buttering the bottom and sides, lining the bottom with parchment paper and buttering the paper. Set aside. 2. Sift together the dry ingredients (flour, sugar, cocoa powder, baking powder, baking soda & salt). Set aside. 3. In another bowl, beat the eggs for about a minute until broken a part. 4. Add the cream, sour cream and melted butter to the eggs. Mix until blended well. 5. Pour the egg, cream and butter mixture into the dry ingredients a little at a time, mixing well after each addition. Mix until the mixture is completely blended and homogeneous. 6. Add the vanilla. Then add the hot coffee to the batter in small additions, mixing well after each addition. Mix in until the batter homogenous. 7. If you are using four pans, evenly distribute the batter into the prepared cake pans. If you are using two, evenly distribute half of the batter between the two pans – you will need to repeat step 6 and 7 with the remaining half of the batter. The batter left to rest may not rise as much as the batter baked aright away. 8. Place the cake pans on a baking sheet. Add the pears to the baking sheet. Bake everything in the oven for 30 to 35 minutes or until a toothpick inserted into the center of the cake comes out just barely clean (a few straggling crumbs is ok). The pears should be soft to the touch – they may need to bake longer than the cake. 9. While the cakes are baking, prepare the fortified caramel and the buttercream frosting according to the instructions. Set both aside. 8. Allow the cakes to cool completely before frosting them. 10. Place one layer on a cake stand or plate. Using a piping bag with a large circle tip pipe large circles of frosting around the top of the cake – so when you press the second layer on top it will give a daisy appearance. You may also use an icing spatula to spread the frosting on top. Place the second layer on top. 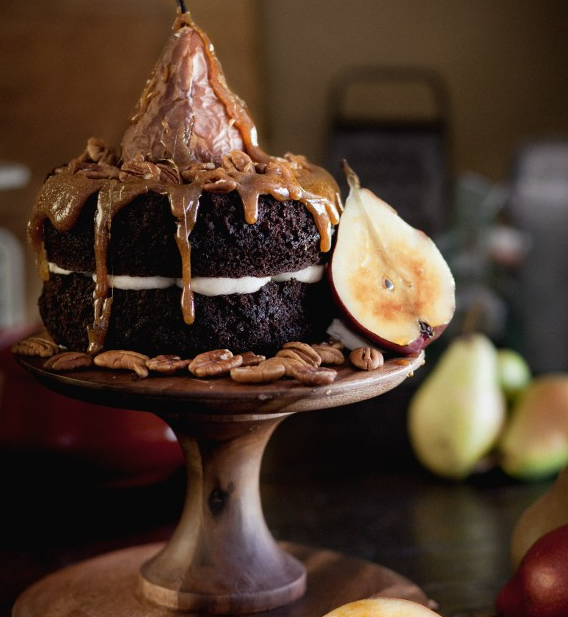 For a caramel drizzled top – Place a whole baked pear on top of the cake, in the center. Sprinkle pecans around the pear. Spoon the caramel over the pear and pecans, letting it pool and drizzle down the sides of the cake. For a pear spiral top – Place a whole baked pear on top of the cake, in the center. Cut another baked pear into 1/4″ wedges. Arrange the wedges in a fanned spiral around the whole pear. Sprinkle pecans on top. For a caramelized pear accent – Cut a baked or unbaked pear in half. Sprinkle sugar on top of the cut portion. Using a torch, or the broiler of your oven, caramelize the sugar like you would on a creme brulee. Let the sugar harden for about 30 seconds before working with the pear. This should only be done right before serving as the juices in the pear will cause the caramelized sugar to liquify after about 30 minutes. r Store in an airtight container at room temperature. This cake should last 3 to 4 days though it is best served the same day. n Avoid adjusting the ingredients in this recipe. Buttercream Frosting: This frosting is the typical, easy-breezy buttercream variety. You throw everything in a bowl and beat until it is creamy. It doesn’t get much easier than this. Here a little cinnamon and cardamom is added to give the frosting a bite. 1. Add all of the ingredients to the bowl. Beat until everything is combined and the frosting is light and frothy. r Store in an airtight container at room temperature. The frosting should last 3 to 4 days. Fortified Caramel: Any caramel that has cream and butter added is called a fortified caramel. It is probably my favorite kitchen concoction as the creaminess and butteriness paired with the delightfully carmalized sugar is a match made in heaven. Making fortified caramel is exactly like making classic caramel, but with fortified caramel you add cream and butter (and possible other flavorings) at the end. Be sure to stand at the stove and watch the boiling sugar closely. As soon as it reaches a golden amber – or caramel – color, remove it from the heat. Sugar can go from caramel to burnt blackjack in a matter of a minute and once caramel is over cooked it is ruined – you will have to start from scratch if that happens. 1. Add the sugar, water, lemon juice and corn syrup into the heavy-bottom pot and place over high heat. Stir until the sugar is dissolved and the mixture is homogeneous. 2. Watching the thermometer and color carefully, boil the mixture until it becomes a golden amber color, or reaches about 325°F. This will take about 10 to 20 minutes. Do not stir during this time. 3. Once the caramel has reached the appropriate color (careful not to let it continue cooking too long) remove from the heat. Carefully pour the cream into the pot while stirring vigorously. STAND BACK as you do this as the caramel and cream could pop and explode upwards. 4. If the mixture is lumpy, place the caramel back over the heat, stirring constantly until the lumps have dissolved. 5. Off of the heat add the butter and cinnamon. Stir until the butter is completely dissolved. 6. Let the caramel cool. r Store in an airtight container in the fridge. The caramel should last up to a week. t Pay attention to the temperature while making the caramel.